I think dreadlocs are the most controversial hairstyle ever. It’s shrouded in mystery and depth. There are so many types of locs and reasons for locking. Sister locs are so small that the hair doesn’t appear to be locked at all. Free-form locs are unmolded and left to freely grow into there own form. Loc extensions are manmade with customizable size and length. Even traditional locs have many variations. Each loc type has its own unique characteristics, appearance, and personality. People are attracted to various loc forms based on their personality and reasons for locking. Sister locs are a subtler look and may be somewhat cosmetic. They can be flat-ironed and made to look like straight loose hair. The toned-down look produced by this process may attract a more conservative person. Free-form locs are less about appearance and more about nonconforming. This method often has a spiritual meaning. A good example is the thick bongo locs grown by Rastafarians because of their religious beliefs. Loc extensions are for the person who wants permanent locs but wants to bypass the challenging stages of growing and developing locs. This process is great for people who wish to maintain a neater appearance, or people who want instant length. Although created with extension hair, the locs bond with the natural hair as it grows and locs. Eventually, the loc extensions become your own and never have to be removed. Traditional locs are usually around the size of a pencil. The traditional methods include comb twists, two-strand twist, or interlocs. These are installed naturally without the use of hair. Although other forms of locs can be started using these methods, it is the grooming cycles and size that distinguish them. These are just a few ways to loc the hair. No matter the method, a transformation takes place when locking. The journey requires commitment, patience, and self-acceptance—not to mention specific grooming techniques and loc-friendly products. The three main phases of locking are infancy, teenage, and matured. The infant phase is usually the most difficult. This is the part where the twists or extensions start to lose that fresh-from-the-salon look. The boxes disappear, and frizz takes over. Although a trip to the salon can tame this stage, grooming too frequently can be damaging to the process. The teenage phase is when the frizzy twists or new growth with loc extensions begin to morph into a loc-like form. It’s not completely a loc but far from the defined look you had on day one. It usually takes roughly six months for the locs to become fully matured. Sometimes it takes longer, depending on the hair texture. When the mature stage is reached, the loc is solid and can withstand submersion, styling, and coloring. Undergoing these phases is like a rite of passage. A bond and, later, a connection is formed after nurturing the locs through the phases. This is one reason why most people are protective of their locs. It’s more than just a hairstyle—locs represent growth, strength, and transformation. Whatever the reason a person locs their hair, and whatever method they choose, a new level of self-acceptance emerges. Locs are beautiful and diverse. They can be styled in hundreds of looks or just left to blow in the wind. You can wash-and-go or style-and-go. Even if you’ve missed a salon visit or two, locs are still gorgeous in the raw. There’s nothing dreadful or locked down about this experience. When done properly, locking is truly liberating. 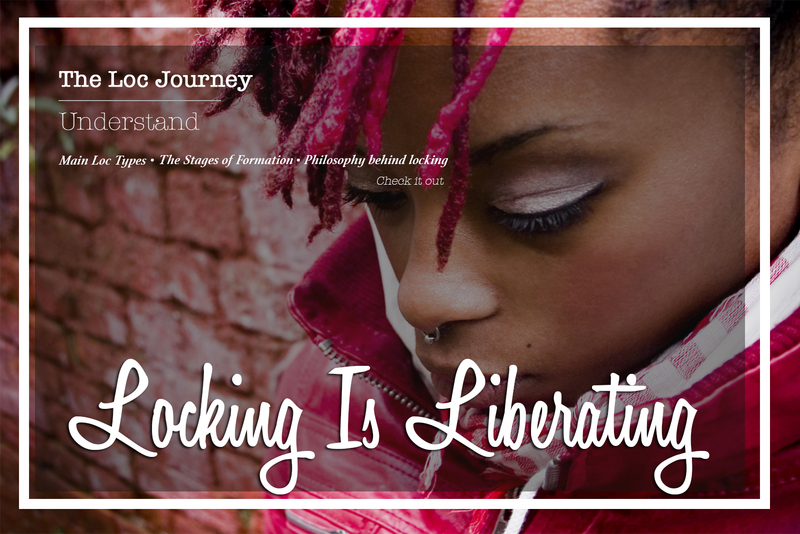 Great blog… Who knew there was so much to locs. Very informative. Daisy, I would love to learn how to do and maintain a twist- out using your products. I am 62 and have not had chemicals in my hair since I was 31, but tired of pressing it. I look forward to hearing from you.